All anesthesiologists should have general safety education on the unique physical environment of the magnetic resonance imaging (MRI) scanner and specific education regarding the specific features of individual scanners within their institution. Education should emphasize safety for entering zones III and IV, with special emphasis on hazards in this environment and effects on monitoring capabilities. Education should address potential health hazards (e.g., high decibel levels and high intensity magnetic fields). Education should address necessary precautions to deal with the specific field strength and the safety of the MRI scanners within their institutions. Education should include information regarding ferromagnetic items (e.g., stethoscopes, pens, wallets, watches, hair clips, name tags, pagers, cell phones, credit cards, and batteries) and implantable devices (e.g., spinal cord stimulators and implanted objects) that should not be brought into zones III and IV of the MRI suite or should be brought in with caution. Anesthesiologists should work in collaboration with radiologists, technologists, and physicists within their institutions to ensure that the above topics are included in their safety training programs. Education should include how to safely respond to code blue situations in zones III and IV, and this information should be integrated into protocols for the designated code blue team. The anesthesiologist should work in collaboration with the MRI medical director or designee (e.g., safety officer) to ensure that all anesthesia team personnel entering zone III or IV have been screened for the presence of ferromagnetic materials, foreign bodies, or implanted devices. The anesthesiologist should communicate with the technologist to ensure that the patient has been screened for the presence of foreign bodies on the patient (e.g., pierced jewelry, rings) before entering zone III. If a patient presents with high-risk medical condition, the anesthesiologist should collaborate with all participants, including the referring physician, radiologist, and technologist, to determine how the patient will be managed during the MRI procedure. Anticipated changes in level of sedation, muscle relaxation, or ventilation may also place a patient in a high-risk situation. For patients with acute or severe renal insufficiency, the anesthesiologist should not administer gadolinium because of the elevated risk of nephrogenic systemic fibrosis. Anesthesiologists should work with their institutions to properly identify and label anesthesia-related equipment according to convention (safe, unsafe, or conditional) for each MRI scanner. 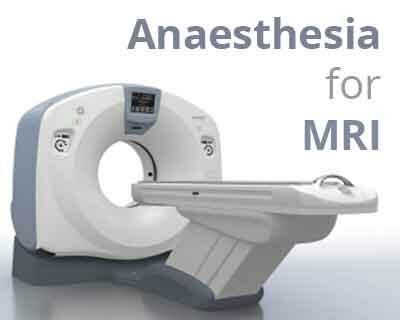 For each MRI location, anesthesiologists should determine the safety and effectiveness of the equipment needed by the patient during the procedure. Care should be taken to assure that the patient’s equipment does not interfere with image acquisition or quality. Cardiac pacemakers and implantable cardioverter-defibrillators are generally contraindicated for MRI. When MRI is considered essential by the referring physician and consulting radiologist, a plan for managing these patients during the scan should be developed in collaboration with the ordering physician, medical director, or on-site radiologist and other appropriate consultants (e.g., the patient’s pacemaker specialist or cardiologist, the diagnostic radiologist, and the device manufacturer). MRI may be performed on a limited basis for patients with certain implanted electronic devices (e.g., deep brain stimulators, vagal nerve stimulators, phrenic nerve stimulators, wire-containing thermodilution catheters, or cochlear implants). In consultation with the referring physician, the radiologist responsible for the procedure, and the neurosurgeon, the anesthesiologist should ensure that the presence of the device has been noted and determined to be MRI safe/conditional before imaging of these patients. For every case, the anesthesiologist should prepare, with support personnel, a plan for providing optimal anesthetic care within the special environment of the MRI suite. In addition to addressing the medical needs of the patient, features of the plan should include (1) requirements of the scan and personnel needs, (2) positioning of equipment, (3) special requirements or unique issues of patient or imaging study, (4) positioning of the anesthesiologist and the patient, and (5) planning for emergencies. The anesthesiologist should communicate with the radiology personnel to determine the requirements for the scan (e.g., duration of the scan, position of the patient or area of the body in the scanner, positioning of receiver coils, and need for periods of paused respiration). The anesthesiologist should communicate with other anesthesia team members regarding individual roles for anesthetic care. The anesthesiologist should collaborate with the MR technologist and/or facility biomedical engineer to determine and demarcate the optimal and safe location of movable equipment in relation to the gauss lines within the MRI suite. The anesthesiologist should choose a location or position for optimal patient observation and vigilance during delivery of care, whether in zone III or IV. Anesthesiologists should have (1) a clear line of sight of the patient and physiologic monitors, whether by direct observation or by video camera, (2) anesthetic delivery equipment located for optimal control of anesthetic depth and rapid intervention, and (3) access to hospital information systems integral to patient care. In preparing for positioning, the anesthesiologist should take into account potential electromagnetic and auditory hazards. Anesthesiologists should prepare a plan for rapidly summoning additional personnel in the event of an emergency. The anesthesiologist should ensure that (1) emergency equipment and drugs are immediately accessible, (2) emergency communication (e.g., phone or code button) is immediately available, and (3) an evacuation plan is in place, including an appropriate location outside the scan room (zone IV) for resuscitation. This location should be complete with physiologic monitors, oxygen, suction, and other appropriate resuscitation equipment. The anesthesiologist should be familiar with the expected limitations of available monitoring equipment. Information from electrocardiograms may be limited due to superimposed voltages from blood flow in the high magnetic field (e.g., ST segment interpretation may be unreliable, even with highly filtered monitors). The anesthesiologist should make sure that all monitors used in zone IV are safe/conditional for the scan. A monitor should be available to view vital signs from zone III when the anesthesia care provider is not in zone IV. Additional care should be taken in positioning electrocardiogram and other monitor leads to eliminate burns, even with nonferromagnetic leads. Although lighter levels of anesthesia may be appropriate during an MRI scan, the anesthesiologist should be aware that these lighter levels may result in airway complications (e.g., laryngospasm, coughing, or other airway compromise) which may necessitate interruption of the scan for urgent treatment and alteration of anesthetic depth. Institutional circumstances, patient characteristics, and anesthesiologist preference may warrant more aggressive airway management and deeper anesthetic levels. Anesthesiologists should ensure that patients who receive moderate or deep sedation are monitored in a manner consistent with their institution’s protocol for monitoring similarly sedated patients elsewhere in the facility. Monitoring of exhaled carbon dioxide should be considered for all patients receiving deep sedation and for patients whose ventilation cannot be directly observed during moderate sedation. Monitoring oxygenation by pulse oximetry is not a substitute for monitoring ventilatory function. Equipment and drugs for anesthetic care in the MRI suite should mirror what is available in other anesthetizing locations including: (1) an integrated anesthesia machine, medical gases, and waste anesthesia gas disposal or gas scavenging, when inhalational anesthesia is administered, (2) suction, (3) adequate electrical outlets and lighting, and (4) storage areas for equipment and drugs. Equipment used in the MRI suite should be appropriate for the age and size of the patient. MRI safe/conditional anesthesia machines are always preferred for use in an MRI facility. When an MRI safe/conditional anesthesia machine is not available, inhalational anesthetics can be administered from an anesthesia machine inside zone III via an elongated circuit through a wave guide. If total intravenous anesthesia is used, it should be administered by using (1) MRI safe/conditional pumps in zone IV, (2) traditional (i.e., MRI unsafe) pumps in zone III with intravenous tubing passed through a wave guide, or (3) periodic bolus injections in either zone III or IV. Although an anesthesia machine may not be required for the administration of total intravenous anesthesia, there must be equipment immediately available for the administration of positive pressure ventilation with oxygen. The anesthesiologist should have an advance plan in place to deal with instrumentation of the airway and common airway problems (e.g., obstruction, secretions, laryngospasm, apnea, and hypoventilation) when patients are in an MRI environment. If the patient is at risk for airway compromise, more aggressive airway management (e.g., use of a tracheal tube or laryngeal mask airway), should be instituted because the patient’s airway may be less accessible when the patient is in the scanner. Complex airway management (e.g., fiberoptic intubation) should be performed in a controlled environment outside zone IV. Alternative airway devices should be immediately available in the MRI suite. Suction equipment should be immediately accessible to the patient’s airway at all times. When a patient has a medical emergency (e.g., cardiopulmonary arrest) in the MRI scanner, the following should occur: (1) immediately remove the patient from zone IV while initiating cardiopulmonary resuscitation (CPR), if indicated, (2) call for help, and (3) transport the patient to a previously designated safe area for resuscitation that is not in zone IV. This location should be as close to zone IV as possible so as not to delay resuscitation efforts and should contain the following resuscitation equipment: a defibrillator, vital signs monitors, and a code cart that includes resuscitation drugs, airway equipment, oxygen, and suction. When a fire occurs in the MRI suite, team members should perform their preassigned fire management task as quickly as possible, in accordance with the ASA practice advisory for the prevention and management of operating room fires. If a team member cannot rapidly perform his or her task in the predetermined order, other team members should perform their tasks without waiting. When a team member has completed a preassigned task, he or she should help other members perform tasks that are not yet complete. In the case of projectile emergencies, team members should perform their institution’s protocol in reaction to this occurrence. If possible, immediately remove the patient from zone IV and discontinue the scan. If the patient is injured, proceed with medical emergency management as indicated above. A controlled quench may be necessary in order to remove the patient from the bore. When a quench occurs, team members should perform their institution’s protocol in reaction to this occurrence. If possible: (1) immediately remove the patient from zone IV and (2) immediately administer oxygen to the patient. Powerful static magnetic fields may persist after a quench, and therefore, the usual precautions apply when entering zone IV. Emergency response personnel should be restricted from entering zone IV during any environmental emergency because of the persistent magnetic field. The anesthesiologist should collaborate with the radiologist and other staff in the postprocedure care of the patient. Patients receiving sedation or anesthesia within the MRI suite should have access to postanesthetic care consistent with that provided in other areas of the institution, including transport to other recovery rooms, dedicated intensive care, or recovery areas within the MRI suite. In all situations, intensive care and recovery areas should include access to vital sign monitors, oxygen, suction, resuscitation equipment, and trained personnel. Patients should be provided oral and written discharge instructions.